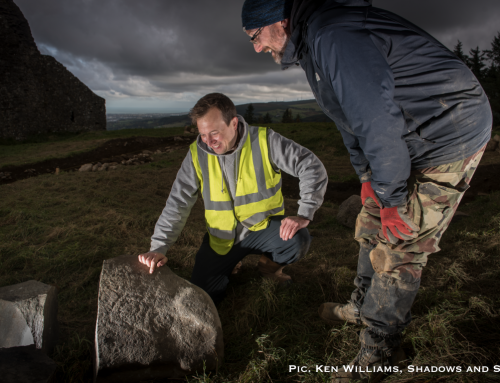 Things began to get really exciting in the third week of the Hellfire Club Archaeological Project. The first trench has continued, with more flint and charcoal being discovered within a very clay-like layer near the base of the trench at the south of the tomb. We have taken a number of soil samples, and hopefully when analysed they may provide charcoal suitable for radiocarbon dating. We will also send samples for pollen analysis. By studying the pollen trapped within the soil, we can understand the nature of the environment that surrounded the site and see if there were forests nearby, what type of plants surrounded the site, and even possibly what type of crops were grown in the vicinity. The first trench even revealed solid evidence of the destruction and plunder of the site in the early 1800s. We uncovered a very large stone, measuring some 2.5 metres (approximately 8 feet long). This stone possibly once formed part of the burial chamber of the tomb, and sat within a large pit. When Ros excavated the pit, he found pieces of early modern glass near the base. Evidence that around 200 years ago, someone tried to dig out the stone to take it away for construction material. So in a sense we have caught the workmen red handed 200 years later! They perhaps gave up when they saw the full size of the stone, and it will be equally difficult for us to move it. The second trench has revealed what appears to be more of the cairn material. While removing a mixed deposit related to the destruction of the tomb, Stephen found a wonderful polished stone axehead that is likely to be at least 5,000 years old. The axe had presumably been unknowingly disturbed by the workmen who constructed the Hellfire Club. They hadn’t noticed (or disregarded) the axe, so it lay there until Stephen found it on Wednesday. The axe is a really beautiful example. We hope to have it confirmed by an expert, but it may be made from porphyry, a type of igneous rock found not far from the site at Lambay Island in Dublin Bay. Axeheads like this one were usually hafted into a wooden shaft. They were made by hours and hours of polishing using water and stone until it forms a beautifully smooth surface. Looking at the cutting edge of our axe it seems like it was never used as it shows no sign of wear or damage. Perhaps it was made deliberately to be buried with a loved one inside the tomb, or perhaps as an offering to the gods or ancestors. It would have been a valuable object at the time, so its deposition here really helps to emphasise the importance of the tomb. 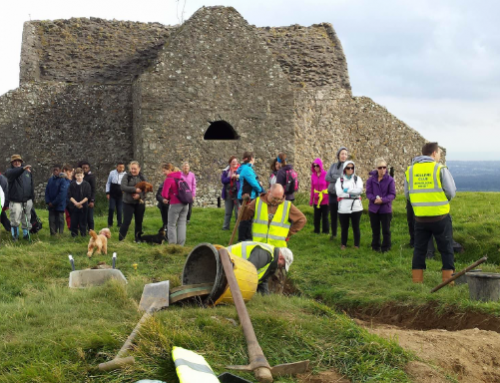 We were really delighted to have our dig featured in a great report by Philip Bromwell of RTÉ earlier in the week, along with articles in the Irish Times, the BBC and local press like the Tallaght Echo. We’re very grateful and it’s helped lots of people to come up to visit the site to see the work progress. We’ve had lots of school visits and it’s been a real pleasure to help to tell the story of this incredible place to all our visitors. If you would like to come and visit the dig you’d be most welcome, but please do so before Wednesday (26th October) afternoon as then we will begin the backfilling process so there will be little to see. We hope the weather remains as kind as it has been throughout the dig! As the dig is nearing its completion we would like to take a moment to acknowledge the fantastic work and support of Dr. Rosaleen Dwyer, the Heritage Officer of South Dublin County Council who has been instrumental throughout this project. 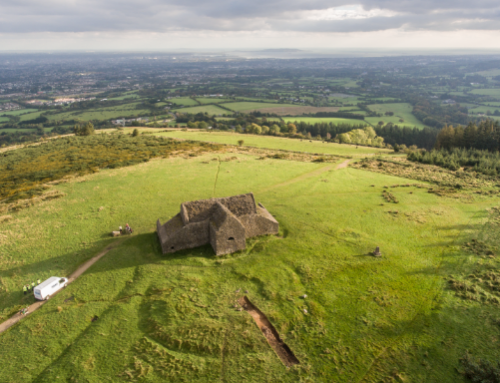 Rosaleen has initiated a really exciting folklore research project about the Hellfire Club with Tallaght Community School and we can’t wait to get started on that after the excavation. We are also really grateful to the excellent team of archaeologists; Lee Scotland, Brí Greene and Dr Ros O Maolduin and the wonderful volunteers Dr Laura O’Gorman, Stephen Matthews, Mark Heffernan, Michala Nagyova, Christina Hughes and Garvan Coleman. We would also like to thank Coillte and Dublin Mountains Partnership for their support throughout this project. What did the tomb on Mountpelier Hill originally look like? That’s a question we may only truly be able to answer if we carried out further investigations at some stage in the future. Based on the antiquarian accounts, shape and what we’ve found during the dig, we think the tomb would have been a passage tomb that appeared as a large mound (or cairn) of stones, with a stone lined entrance leading to a passageway made again of large upright stones (known as orthostats). The passageway would have led to a burial chamber, that may have been circular, rectangular or cruciform in shape. One of the best preserved of the passage tombs in the Dublin and Wicklow Mountains is on the top of Seefin in County Wicklow. This beautiful tomb was excavated in 1931 by Macalister, and it is well worth the steep climb to visit. 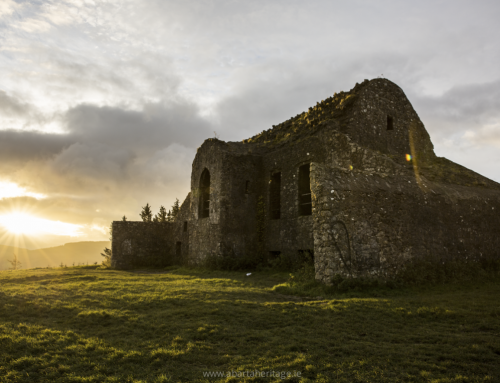 You can find directions in my guidebook to the best historical sites to explore in Ireland’s Ancient East. Would the axe have been of practical use, like say a flint tool, or was it more of a status item. And where would they have got the stone for the tombs? Is the hill a place where there’s loads of stone or would it have come up from say, Ballyknockan round by the lakes? And if they had to bring the stones up, how did they do it? Would they have had ponies or oxen to drag them? Mind you, Fionn McCumhaill was only down the road lounging about on Keadeen Mountain wasn’t he – I suppose he could have come in useful!